During World War II, most of the ball bearings required for the Nazi army’s military and support vehicles were manufactured in Schweinfurt in eastern Bavaria. Army Air Force officials were convinced that destroying these manufacturing plants would severely affect the Nazi war effort. So Allied leaders planned a massive bombing raid to destroy the factories at Schweinfurt. They did not realize that the Germans had already stored a supply of the bearings and they were able to obtain more from plants in Sweden and Switzerland. The Germans in 1943 improved their radar and ground to air defenses in response to the increased bombing raids by the US Army Air Force’s Eighth Air Force and the Royal Air Force. On August 17, 1943, the Allies launched a raid on the bearing manufacturing facilities in Schweinfurt and airplane plants in two nearby cities. Boeing B-17F formation over Schweinfurt, Germany, on August 17, 1943. The attacks reduced the Nazi’s bearing production capacity by 34 percent, but the loss of 60 bombers in the raid forced the Allies to delay a follow-up attack on Schweinfurt until the 14th of October. As a result of the losses in the August 17 raid, the Allies developed new tactics for the next raid. Instead of splitting up the force between three cities, the entire force would attack Schweinfurt. The Eighth Air Force also upped the number of fighter escorts, but their range prevented them from escorting the bombers into Germany. 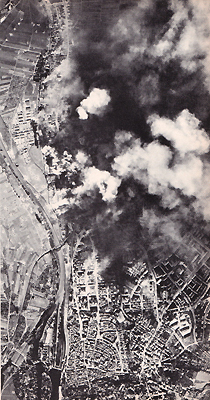 Two hundred and ninety-one bombers flew to Schweinfurt, splitting into two groups to attack the bearing plants there. As they crossed into Germany, they met the strongest air defenses they had seen up to that point in the war. 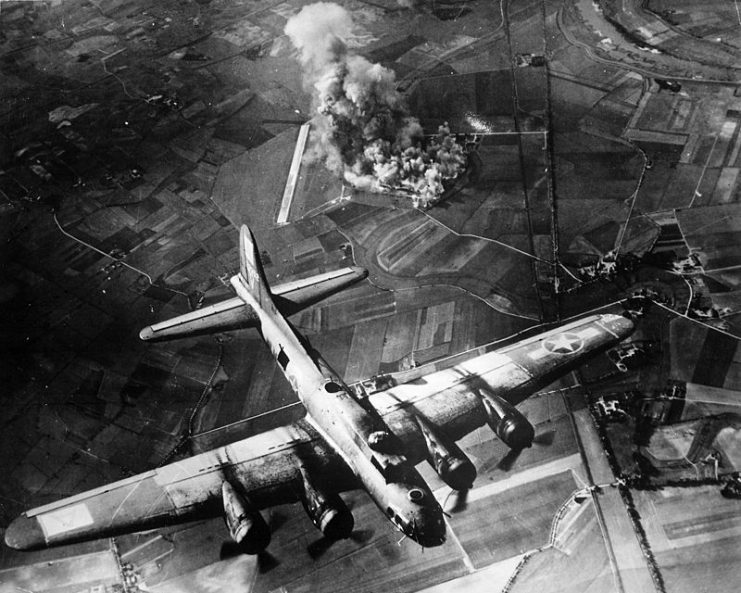 United States Army Air Forces strategic bombing raid on the ball bearing works at Schweinfurt, Germany. 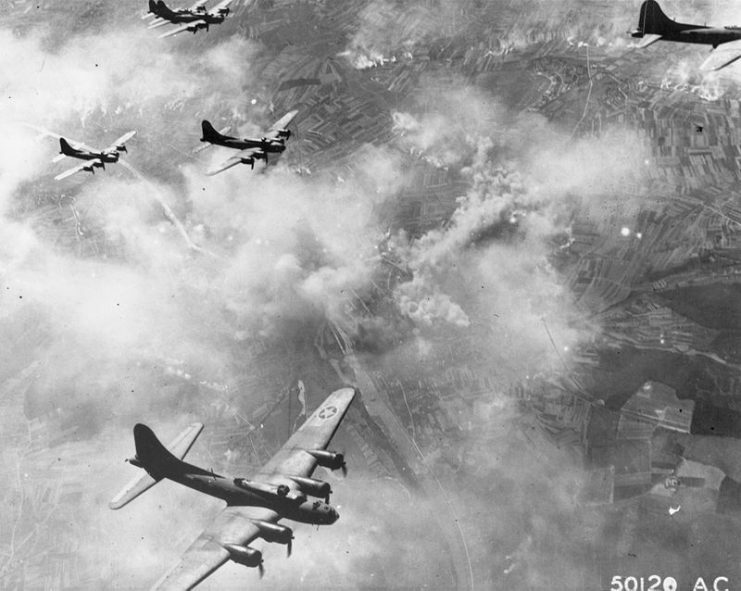 Sixty B-17s were lost in the attack. Seventeen were so badly damaged they had to be scrapped after returning to base. Most of the rest of the bombers received damage that could be repaired. In all, 25 percent of the attack force was lost. 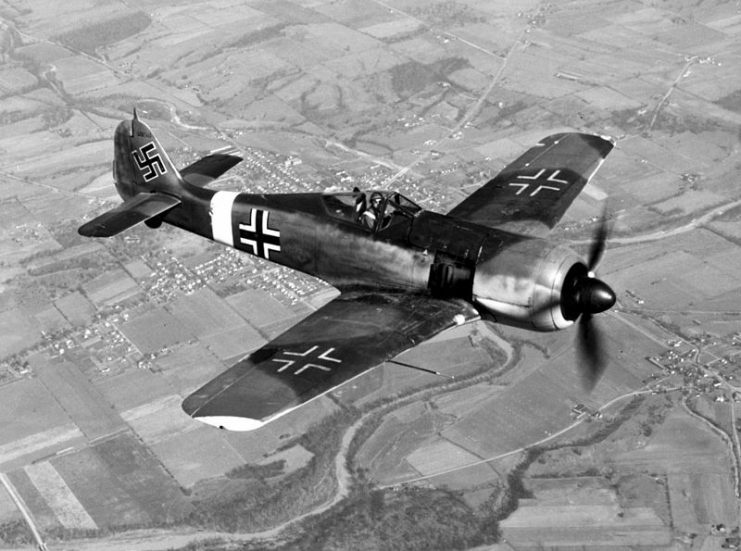 The Luftwaffe lost 38 fighter planes, but most of those pilots bailed out and were free to return to duty. The Americans lost 20 percent of their aircrews. Six hundred and fifty Americans were killed or taken prisoner, and a large number of others were injured. 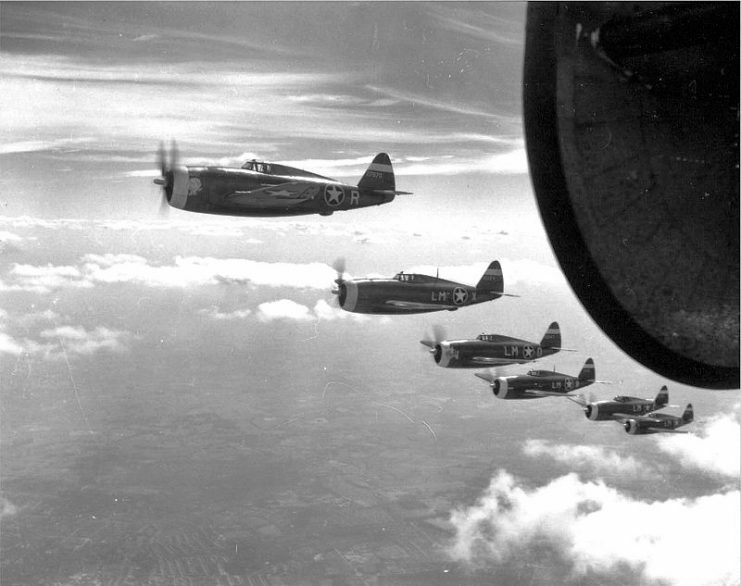 USAAF P-47 Thunderbolt fighters, assigned to protect 8th Air Force bomber formations and to hunt for German fighters. A captured Focke-Wulf Fw 190A in replicated Luftwaffe insignia. To make matters worse, even with the damage, the bearing plants were back in production within six weeks. While the buildings were heavily damaged, the actual machine tools were practically untouched. Germany pulled from its stockpiles until it could get the bearing plants back online. The disruption to the German war machine was minimal. 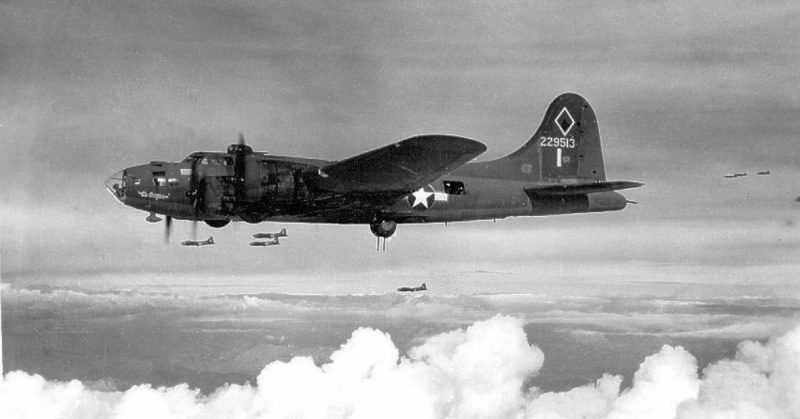 8th Air Force B-17 during a raid on October 9, 1943, on the Focke-Wulf aircraft factory. The raid made it clear to the Allied leaders that they could no longer run bombing missions into Germany without fighter escorts. 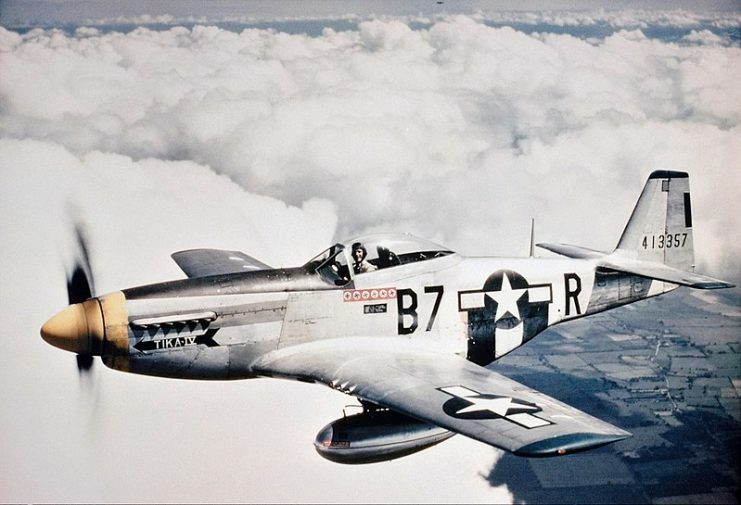 They ordered external fuel tanks added to the P-51A Mustang fighter plane, making the P-51B. The new fighters would not be ready until 1944, so the Allied leaders canceled the bombing raids into Germany and did not resume them until the middle of January. Today, “Black Thursday” is known as the day that the Eighth Air Force lost air superiority. It was proof that the unescorted daylight precision bomber doctrine which was developed in the 1930s was a failure.